ALASKAVIDEOSHOOTER.COM is a blog about documentary filmmaking, video production, and the gear that makes it possible. The blog is edited by Slavik Boyechko, co-owner of Video Dads LLC, which provides video production in Portland Oregon and in Alaska, as well as Gear Dads, a site about videography and video production equipment. If you're interested in video production services in Alaska, Oregon, Washington, or anywhere in the U.S., contact me here or email slavik (at) videodads.com. What is the purpose of ALASKAVIDEOSHOOTER.COM? 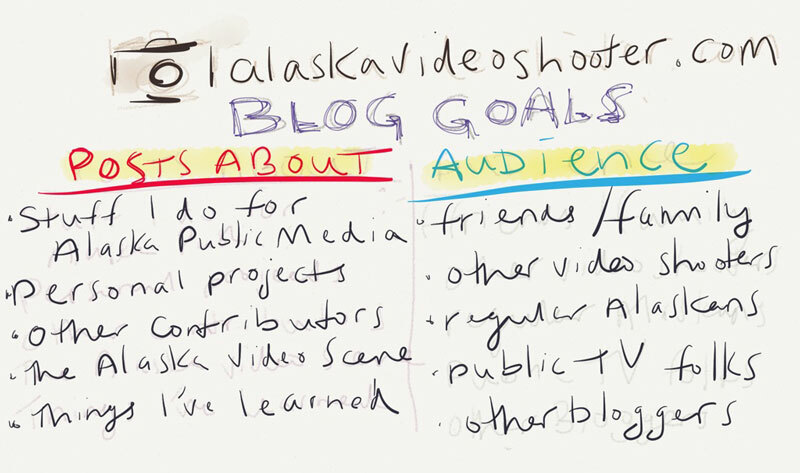 Posts about videos I’m working on for Alaska Public Media, like the INDIE ALASKA series. Show behind-the-scenes of other videos and photo projects I do for friends and family. Grow a base of other contributors who post about what they’re working on. Interviews with Alaskans video and film people. Things I learn about filmmaking as I continue this creative journey. Friends and family who want to follow along. This blog will allow me to go more in-depth about my video work than simple Facebook posts of the final projects. Other video shooters in Alaska and beyond. People outside my friends/family network who aren’t filmmakers but who are curious about this stuff. Public TV (PBS) people who are on a similar video track at their station. There’s like a million other bloggers who I’d love to chat with, and it seems like having your own blog is the first step to joining that network of like-minded digital people. I like illustrating concepts, so I’m going to be using the Paper Ipad app for a lot of stuff. Also lots of photos. I think I’ve had like 2 or 3 blogs throughout high school and college, but blogging has changed a lot since then, so I consider myself a newb to this. Don’t judge! alaskavideoshooter.com is a participant in the Amazon Services LLC Associates Program, an affiliate advertising program designed to provide a means for sites to earn advertising fees by advertising and linking to amazon.com.